Add some green deliciousness to any meal (hey, even breakfast!) 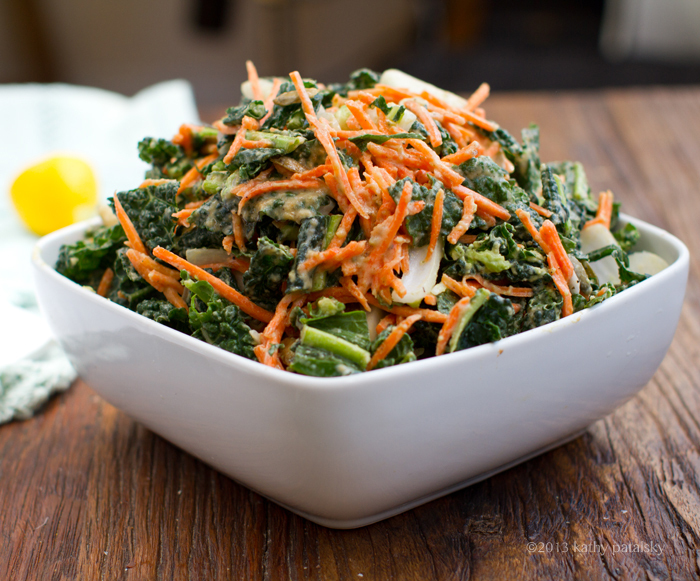 by learning how to whip up this simple (make-ahead approved) recipe for 5-Step Raw Kale Salad. Go-To Recipe. I make this dish A LOT and love it because once you learn the basics you can change things up by adding in a wide variety of fresh veggies, roasted veggies, fresh fruit, dried fruit, nuts, seeds, pickled veggies, beans and other vegan goodies. 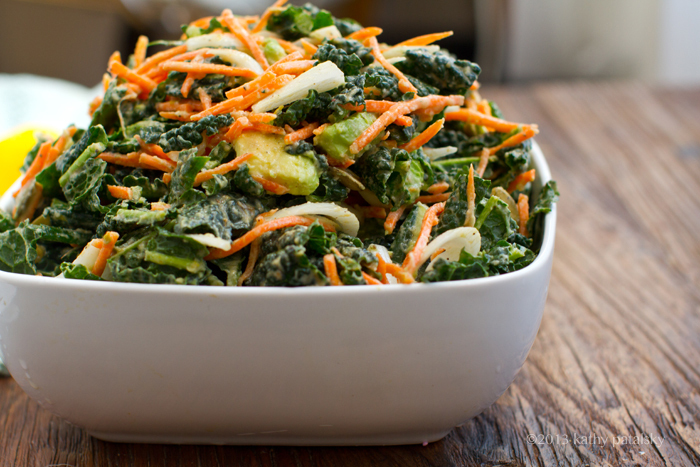 Raw Kale Salad. Yup, it still seems to be everywhere I look these days. 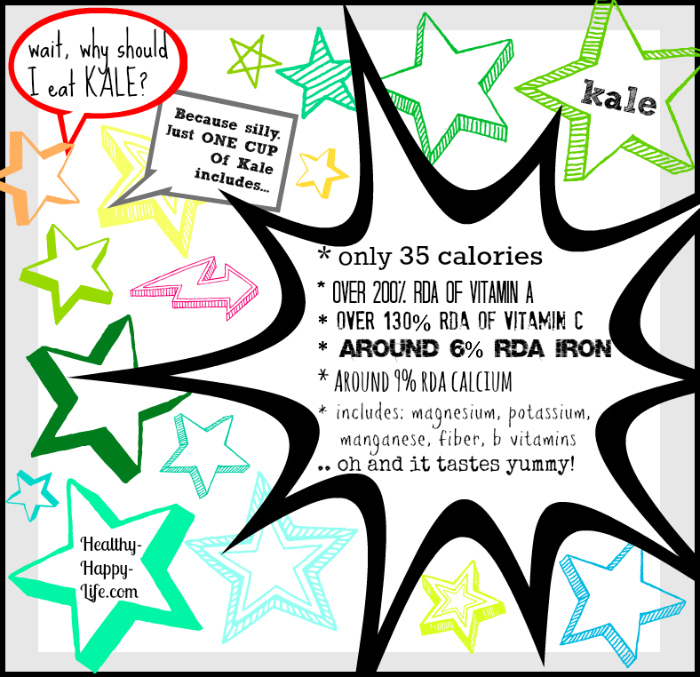 And just in case you needed a reminder, kale is indeed PACKED with nutrients.. 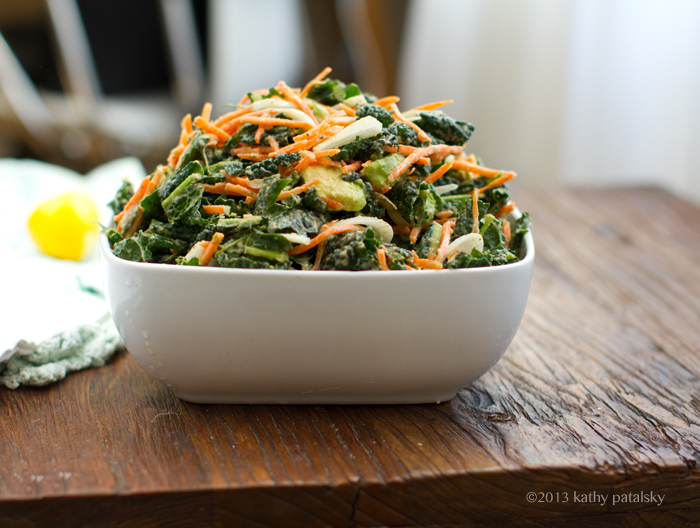 Whenever I think of raw kale salad I think of my friend Gena. You guys may remember a video we did a few years ago..
Gena introduced me to her massaged version of raw kale salad for our 'summer recipes' video shoot. The scene: We were smiling and happily running around doing our video shoot showcasing a few beloved vegan summer recipes when Gena said she would be making a massaged kale salad. I was thrilled because hey, I love raw kale salads! But wait, did she say "massaged" kale salad? I had kinda 'heard about' massaging kale but never seen it first hand. And then suddenly Gena was on camera with me, chattering away in my living room, wrist-deep in her bowl of salad massaging the heck out it! All those veggies and raw kale bits were getting some serious five-star spa-like pampering. If you watch the video you can see I was a little shocked by the hands-on-ed-ness of it. But ya, it tasted AMAZING. ..OK, I get it now! Do you massage your kale? Well I personally do not often do hands-on deep tissue to my raw kale salad leaves. I usually just do a vigorous fluff-n-fold-n-chill approach and let time do the 'softening' work. So I let my dressing-tossed kale sit in the fridge for about 1-8 hours (prep in the AM, eat by dinner) and by then the flavors are infused and the greens softened. 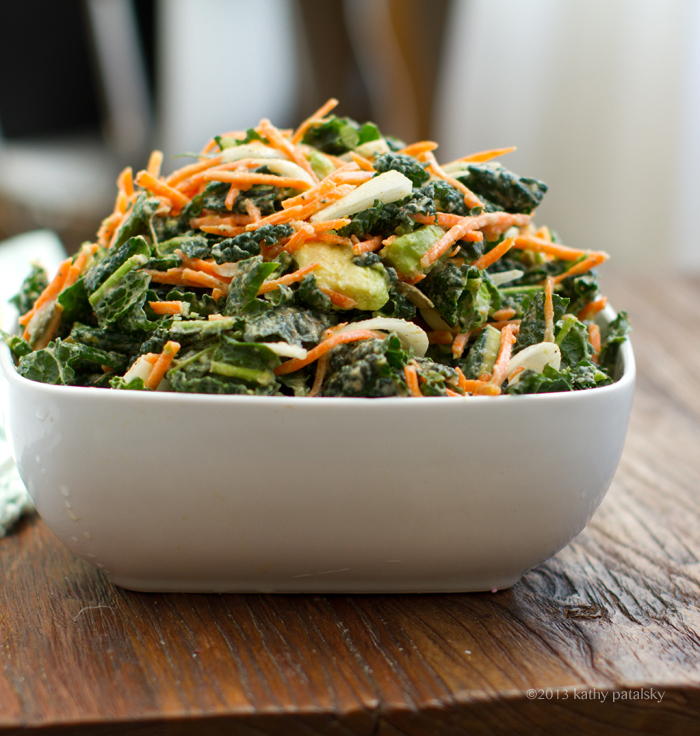 Or for crunchy kale, you can eat ASAP. THE SEED Vegan Experience!! Speaking of Gena, I am super excited that next month Gena and I will be doing a duo presentation on MY favorite topic: vegan smoothies! Demo included! We will be chatting up all things blogging, eating, vegan smoothie-making, Vitamix-loving and anything the audience wants to ask us a la Q&A sesh. This will be my first big presentation at a big "vegan" event so I am excited! I will also be hanging out at a Healthy Happy Life / Finding Vegan booth hopefully handing out recipes cards and maybe a few more goodies to remind people to buy my book 365 Vegan Smoothies which will go on sale shortly after the event. If you are in NYC please come say hi! I'd love to meet you! Buy 50% off tickets while they last! Step 2. Prep your ingredients. Remove the thick vein from your kale leaves and discard. (You could keep this on, but it is quite chewy.) Also prep your other veggies however you'd like. 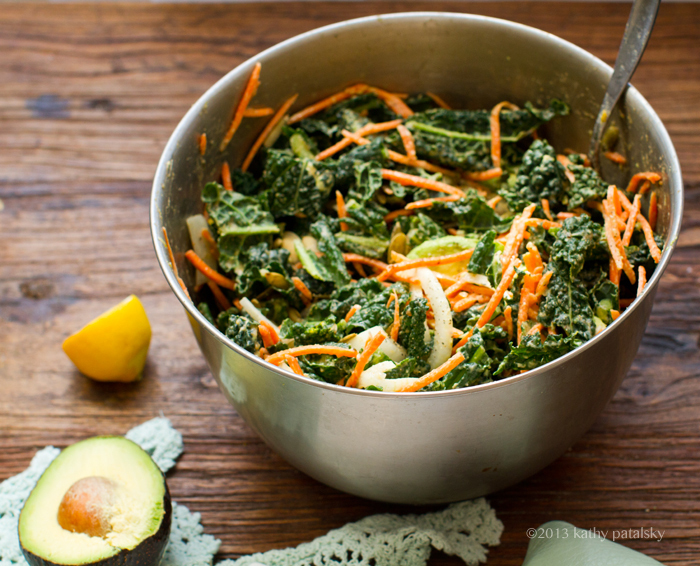 Chop, dice, cube, shred... Add the chopped kale and veggies to a large mixing bowl. Step 3. Make your dressing. In a small bowl, whisk your dressing together. Step 4. Toss! 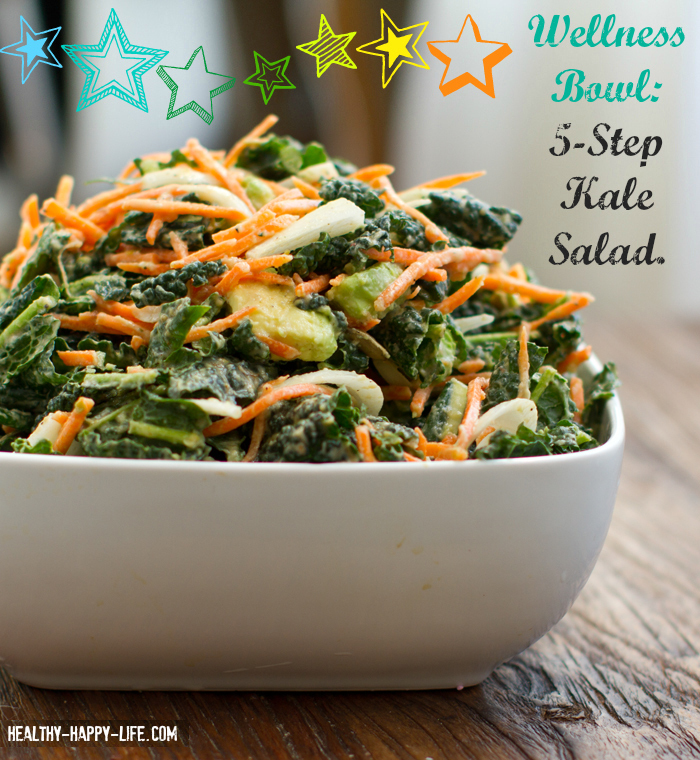 Add the dressing to your bowl of veggies and kale and start tossing! You could massage if you'd like :) Fluff and toss until the dressing is well absorbed into the greens and veggies. Step 5. Chill it! Allow at least an hour for the dressing to really sink into the ingredients. Plus chilling everything makes it refreshing and tasty as a cold salad side. 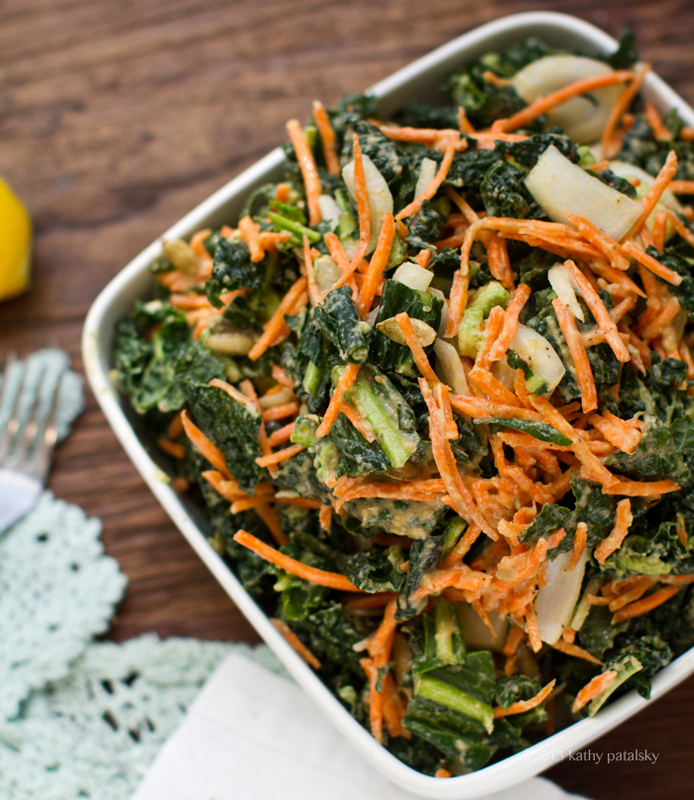 You can even make this salad the night before you serve it. Overnight chilling works! The greens should be eaten within 48 hours though. *you can easily change up the veggie and other add-ins as desired. * If you want to lighten up the dressing, substitute fresh orange juice for the EVOO. * You can use raw agave syrup or brown rice syrup in place of maple if desired. * Add a splash of tamari in place of the salt if you have it on hand! * Be sure to stir stir stir first if your tahini settled with oil on top! * Add a splash of apple cider vinegar if you'd like a perkier, more acidic dressing. * I like to use pink Himalayan salt. * Freshly finely chopped parsley is a very nice touch for this dressing.